The Hyundai Elantra is a stylish, fuel-efficient compact car that can go toe to toe with competitors like the Honda Civic, Toyota Corolla, and Ford Focus. Though only one engine choice is offered, the Elantra expands its model range for 2013 with the addition of a sleek coupe or a versatile 5-door hatchback. Wiring issues-all the rear lights and steering wheel controls short out 24/7. We bought our 2013 Elantra limited 14 months ago- we loved it at first but it had low profile tires so any little pot hole in the road or if you run off the shoulder and get back on it easily blows out the tire. We've replaced 4 tires that way. We have 3 kids one who’s in a infant car seat so there's literally no room in it for all of us plus extras (bags etc. ) It is also very loud as in the when your on the highway you can hear everything vs. Some vehicles block out a lot of the noise. But the biggest problem, we had the car for about a month and the tail lights started shorting out so we replaced them one by one and it’d work for a day or two then a different one would quit working. Now it is to where if our headlights are on-the brake lights stay on constantly so you cannot see when we're breaking, but if we have the headlights turned off the break lights work like their supposed to. We've taken it to a mechanic and he said someone installed a breathalyzer in it before then removed it before we bought it. But when they do that apparently it screws up the wiring? Not sure but when your driving straight the buttons on the steering wheel work but if your turning or it is raining the buttons no longer work? I am guessing another wiring problem? We’ve googled problems in the 2013 limited class and it looks like a lot of other people have the same problem. We've gotten pulled over 5 times because of the brake lights. We hate this car because of all the mess it is caused us. I just think it is pretty neat! Me and my roommates and I really enjoy the seat warmers on cold days and enjoy the sunroof on hot days. The leather material of the seating is usually too hot to sit on during the summer time, but otherwise is very comfortable. I enjoy the speakers and the max volume level, as well as the storage space in the console and between the seats. The cup holders on the doors are awkwardly angled and I often spill drinks when I attempt to place drinks there, and many a drink has blatantly lost a lid because of the tight space. The leg room in the front seat is very nice but a little minimal in the back seat. When I have taller passengers they are often rather cramped, regardless of how far forward the front seats go. The trunk space is adequate, though lacks any room for a spare tire and I wish it had space for one as well as all of the things I keep in my trunk. My car was transferred to me from my dad and I was unaware that I did not have a spare tire in the back so was pretty distressed when there was no tire back there. The sun roof is nice but just a little bit awkward to open and close because you have to press the button twice in order for it to completely close. I do not exactly like the tail at the back end of the car, because it gets in the way of rear-view mirror regardless of how I adjust it. I've driven Hyundai's since I was 19! 3 different Elantra! And I definitely enjoyed driving each one! 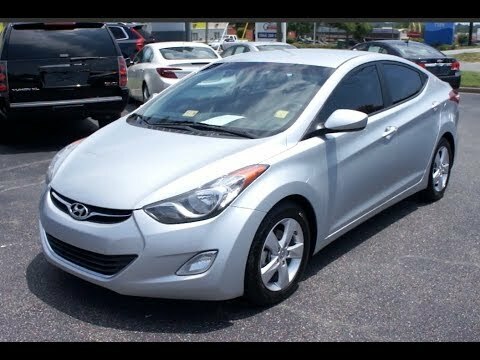 I have own a 2011 gls limited model and a 2015 GT model but my current one is a 2013 Elantra! They've all have always been very comfortable and amazing little cars. Heated seats, sunroof, power everything, Bluetooth, XM and just all the regular nice basics you want. It drove amazing! For a smaller sedan it had a lot of inside room. The only thing bad about the three I have owned is that they've all have had major engine problem! And it's been the same exact issue. Starting around 65, 000 miles I would start to hear a small like tick from under the hood but it would only last until the car just warmed up and then it was gone but the more and more the miles went up it started making that noise longer and would start to get a little louder but then die off still and you wouldn't be able to hear. And then around 75000 miles its a permanent sound and it's a lot louder and more rough. Had it looked at multiple times and its and lifter that somehow got bent or something like that. But without having your engine ripped apart open to be fixed there's not much to do. Both the others cars engine died before I could save enough money to cover the labor it would cost. Why Did I Just Buy A Hyundai With 165,000 Miles On It? !